Breathe easy on the go! Boost Oxygen® Pocket Size canisters are perfectly portable for a boost of energy and vitality anytime, anywhere. Simply remove cap, press button firmly and inhale. 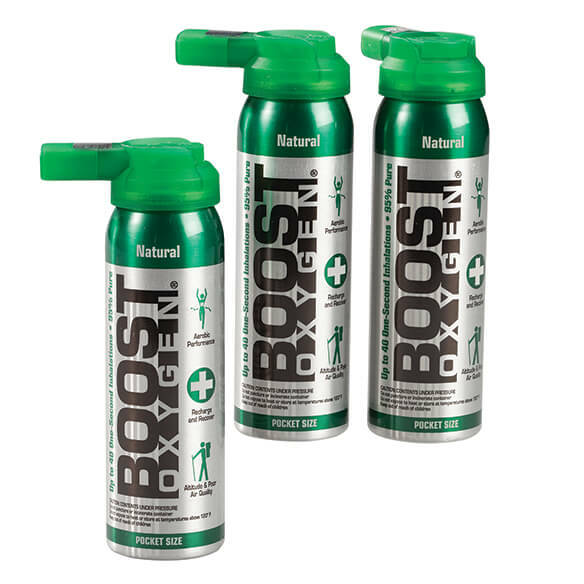 These oxygen canisters are perfect for seniors, active people and high-altitude visitors. Sized just right for storing in a nightstand drawer or taking on the go in a purse, pocket or glove box, for approx. 50 seconds of continuous flow, or 15–50 inhalations of varying lengths. 100% natural, 95% Pure Aviator’s Breathing Oxygen (ABO), 5% ambient air. No aromas have been added. Set of 3, 2 Liters each. For Pocket Size canisters, remove tamper-evident plastic and remove cap. Place up to mouth, press button firmly and inhale. On oxygen almost 24/7, and these small pocket size BOOSTS enable me to shop and run short errands. I have lung damage, and need extra O2 occasionally. Handy for purse when walking.